When the prophet Daniel received the visions he recorded the angel of the book of Revelation informed him that the book was to be kept shut and secret until the end of the age. The author believes we are in that critical period now. Many books have been written in an endeavor to clarify the meaning of Daniel's visions and solve the chronological factors hidden in the numbers given to him by the Angel of Revelation. In spite of the attempts to master these problems however the Book of Daniel has persisted in remaining an enigma. Until now no writer has been able to penetrate its intricate mysteries. 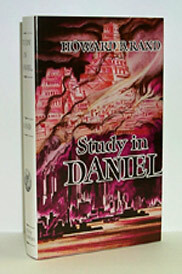 When Daniel received the revelations the Angel informed him that the book was to be kept "shut as a secret" until the crisis at the end of the age. Now for the first time the key that unlocks the secrets sealed in Daniel's records is known. Readers of this book will understand the method by which the Angel revealed and at the same time concealed the full knowledge of the future in the statements made to the prophet. Part I is devoted to the history of World Empires as was given to Daniel before any of those world empires had come into being. The accuracy of prophecy is demonstrated as nation after nation marched onto the stage of world activity in fulfillment of the Prophet's recorded accounts. Part II is devoted to the remarkable visions seen by Daniel describing in symbol the great political, economic, and religious systems of the nations and the order of world warfare. Concealed in these visions is the minutely detailed account of the order of events leading to the climax of the ages and by the marvelous chronological measuring rods used to define the time period we are given an exact time table of their occurrence. These are the facts which were to be revealed just at the crisis period. It was Mr. Rand's opinion based on his earnest study that we are in that critical period now and for the first time since Daniel received those remarkable revelations over twenty-five hundred years ago the seals are broken. Daniel's inquiry was "O my Lord what shall be the end of these things?" The author believed that we now have the answer to that question. Study in Daniel is a must for Prophetic students and for all who are numbered among those of whom the Angel was speaking when he said "The wise shall understand."